In Object-oriented programming, one object is related to other to use functionality and service provided by that object. This relationship between two objects is known as the association in object oriented general software design and depicted by an arrow in Unified Modelling language or UML. Both Composition and Aggregation are the form of association between two objects, but there is a subtle difference between composition and aggregation, which is also reflected by their UML notation. We refer association between two objects as Composition, when one class owns other class and other class can not meaningfully exist, when it's owner destroyed, for example, Human class is a composition of several body parts including Hand, Leg and Heart. When human object dies, all it's body part ceased to exist meaningfully, this is one example of Composition. Programmers often confuse between Association, Composition and Aggregation in Object oriented design discussions, this confusion also makes the difference between Association, Composition and Aggregation one of the popular questions in Java Interviews, only after the difference between abstract class and interface . Another example of Composition is Car and it's part e.g. engines, wheels etc. Individual parts of the car can not function when a car is destroyed. While in the case of Aggregation, including object can exists without being part of the main object e.g. a Player which is part of a Team, can exist without a team and can become part of other teams as well. Another example of Aggregation is Student in School class, when School closed, Student still exist and then can join another School or so. In UML notation, a composition is denoted by a filled diamond, while aggregation is denoted by an empty diamond, which shows their obvious difference in terms of strength of the relationship. The composition is stronger than Aggregation. In Short, a relationship between two objects is referred as an association, and an association is known as composition when one object owns other while an association is known as aggregation when one object uses another object. In this OOPS tutorial, we will see a couple of more examples to understand difference between Association, Composition and Aggregation better. Here is an example of composition and aggregation, in terms of Java Code. By looking at this code, you can gauge differences between these two. By the way, Composition is also very much preferred in object oriented design over inheritance, even Joshua Bloch has stated its importance in the classic book, Effective Java. Composition : Since Engine is-part-of Car, the relationship between them is Composition. Here is how they are implemented between Java classes. UML has different notations to denote aggregation, composition and association. Association is denoted by the simple arrow while aggregation is denoted by empty diamond-head arrow and composition is denoted by filled diamond-head arrow. When you draw UML diagram for two related class A and B, where A is associated with B then its denoted by A -> B. Similar way is used to show aggregation and composition between two classes. Here are UML notations for different kind of dependency between two classes. As I said all three denotes relationship between object and only differ in their strength, you can also view them as below, where composition represents strongest form of relationship and association being the most general form. Here is the list of differences between Composition and Aggregation in point format, for quick review. As I said the key difference between them comes from the point that in the case of Composition, One object is OWNER of another object, while in the case of aggregation, one object is just a USER or another object. 1) If A and B two classes are related to each other such that, B ceased to exist, when A is destroyed, then the association between two objects is known as Composition. An example is Car and Engine. While if A and B are associated with each other, such that B can exist without being associated with A, then this association in known as Aggregation. See Head First Object-Oriented Analysis and Design for more examples of Composition and Association in OOP. 2) In the case of Composition A owns B e.g. Person is the owner of his Hand, Mind and Heart, while in the case of Aggregation, A uses B e.g. Organization uses People as an employee. 3) In UML diagram Association is denoted by a normal arrow head, while Composition is represented by filled diamond arrow head, and Aggregation is represented by an empty diamond arrow head, As shown in below and attached diagram in the third paragraph. 4) Aggregation is a lighter form of Composition, where a sub-part object can meaningfully exist without main objects. 5) In Java, you can use final keyword to represent Composition. Since in Composition, Owner object expects a part object to be available and functions, by making it final, your provide guarantee that, when Owner will be created, this part object will exist. This is actually a Java idiom to represent a strong form of association i.e. composition between two objects. 6) Another interesting word, which comes handy to understand difference between Composition and Aggregation in software design is "part-of" and "has". If one object is-part-of another object e.g. Engine is part of Car, then association or relationship between them is Composition. On the other hand, if one object just has another object e.g. Car has the driver then it's Aggregation. That's all on the difference between Association, Composition and Aggregation in UML, Java and Object oriented design. Since object oriented analysis is more about defining the relationship between object, it's important to know what kind of relationship exists between them, composition and aggregation is a two way of representing relationship between two objects. "cow HAS four legs " this is Composition but according to your example - "Car HAS driver" than it's Aggregation. so somewhere HAS working as composition and aggregation . confusion please clarify . Think it like this. If the container object dies, then the object inside container will die. If cow(container) dies, the objects(legs) are also dead. This is composition. That is not the case in aggregation. If car(container) dies, not necessary that the object(driver) should die. Hence this is aggregation. Hope this helps. @Javin very perfectly explained..Thanks , lem me add the below points in short..
Association is a relationship where all objects have their own lifecycle and there is no owner. Let’s take an example of Teacher and Student. Multiple students can associate with single teacher and single student can associate with multiple teachers but there is no ownership between the objects and both have their own lifecycle. Both can create and delete independently. Aggregation is a specialised form of Association where all objects have their own lifecycle but there is ownership and child objects can not belong to another parent object. Let’s take an example of Department and teacher. A single teacher can not belong to multiple departments, but if we delete the department teacher object will not be destroyed. We can think about it as a “has-a” relationship. Composition is again specialised form of Aggregation and we can call this as a “death” relationship. It is a strong type of Aggregation. Child object does not have it's lifecycle and if parent object is deleted all child objects will also be deleted. Let’s take again an example of relationship between House and rooms. House can contain multiple rooms there is no independent life of room and any room can not belong to two different houses. If we delete the house - room will automatically be deleted. Let’s take another example relationship between Questions and options. Single questions can have multiple options and option can not belong to multiple questions. If we delete questions options will automatically be deleted. Hello Saral, nice to see you back here. Thanks for your useful comment and adding value to this article. Could you please help me know the difference between the Association and Dependency? Hello @Raju, welcome to Javarevisited. Please check my post on composition vs inheritance. The "25" is "expanded" by the compiler to an object directly in the enclosing object. Destroy the object and the expanded "25" INTEGER object goes away too. A Has-a reference type is different. It is a field on a class which has a pointer to another object. Destroy the object with the reference and the object referenced remains (i.e. is not destroyed). An Is-a inheritance relationship is the object itself. Destroying leaves a state that is self-evident (i.e. axiomatic). The difference between the two variants of Has-a reference type relationships is that when destruction of the enclosing object destroys the subordinate objects, then you have Aggregation. Otherwise, if the other objects are not destroyed, then the relationship is simple Association. You control this. There is no magic. Actually, all objects live in either direct or indirect Aggregation of the root object and its creation procedure. The notions of Aggregation, Association, and Composition are handy mnemonics to help you design. They are not "Object Oriented" themselves. Notions of Aggregation, Association, and Composition are loose design patterns to help you compose and design your object world. you said that relationships between teachers and school should be association because when the school doesn't exist the teacher still can exist in another school. What if the relationship between lecture of Taylor and Taylor? is it different now? Should it be a composition relationship now? because if Taylor University did not exist, lecturer of Taylor also wouldn't exist, lecturer in other universities is not lecturer of taylor university. Thank you @Satish and @Deepak, glad that you find information given here useful. 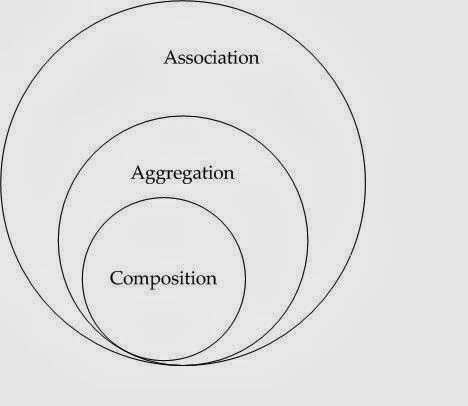 composition represents 'has-a' relationship as i studied in java books, but here aggregation is 'has-a'. confused!! @Arun, Composition, Aggregation, and Association all represent "has-a" relationship in some sort or other. What's still confusing to me is why even have association at all? Since an association can be broken into aggregation and composition. I have yet to read an example that showed a difference between association and aggregation. Only reason you would include an association is if you don't know if objects are to be aggregation or composition or that it can be either one. But that would leave ambiguity. Hello, if Composition and Aggregation are both types of Associations, then why do we have a separate notation for Association in UML. A -> B. Could you give an example of an Association which is neither Aggregation nor Composition? driver is not part of the car.